Family dramas can make for very interesting reading. Add in a cultural element and the story can get all the more interesting. 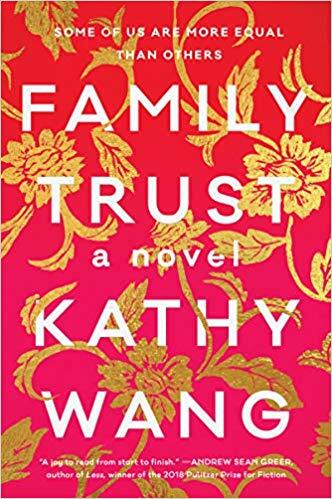 Family Trust by Kathy Wang was sent to me by TLC Book Tours for my honest review at no charge. For his son, Fred, the inheritance Stanley has long alluded to would soothe the pain caused by years of professional disappointment. By now, the Harvard Business School graduate had expected to be a financial tech god—not a minor investor at a middling corporate firm where he isn’t even allowed to fly business class. Stanley’s daughter, Kate, is a middle manager with one of Silicon Valley’s most prestigious tech companies. She manages the capricious demands of her world-famous boss and the needs of her two young children all while supporting her would-be entrepreneur husband (just until his startup gets off the ground, which will surely be soon). But lately, Kate has been sensing something is amiss; just because you say you have it all, it doesn’t mean that you actually do. Visit Kathy’s website and connect with her on Facebook, Twitter, and Instagram. Stanley Huang has learned he has cancer. Such sad news is the driver of this novel about family relationships good, bad, indifferent and possibly criminal. Stanley has a wife, and ex wife and two children. His daughter is married to a somewhat sketchy guy and his son is trying hard to be more than he is. The ex wife is concerned for her children’s inheritance but knows that Stanley is all talk. His current wife is all show and knows relatively little about the true nature of her husband. The book goes back and forth between all of the featured players, sharing how they deal not only Stanley’s diagnosis and decline but the whirlwind of their everyday lives. Fred is divorced and seeing a high maintenance woman who wants him to put a ring on it. He has puffed up his job significance and his importance in his field. She is a social climber and always looking to work an angle. Kate is married and has a very good job and supports her husband in his entrepreneurial dreams – until she can’t figure out exactly what it is he is doing all day long. When she starts to investigate she is not sure she is going to like what she finds out. Stanley’s ex is concerned for both of her children and wants to make sure they get their rightful inheritance as she did the heavy lifting in building whatever fortune Stanley may have. She put up with his temper and his emotional abuse until she left and found a freedom she didn’t realize she could have. Now she doesn’t want the upstart second wife to get what her children deserve – not that she thinks there is all that much there. The second wife is much younger and really, at this point only out for herself. There is a LOT going on in this book and I haven’t really even touched on half of it in the paragraphs above. There are Fred’s work problems, a catfishing subplot, a group of gossipy Ladies Who Lunch, rich prep school boys and an attempt to defraud the Thai government. And MORE! It’s a lot. Too much I think. A thread is picked up in one chapter then dropped and picked up a few chapters later. Maybe it’s me but I prefer a more linear story line. This way of writing works in many cases but when there is this.much going on it’s a little bit hard to keep track of it all. Or maybe I’m just getting old. I don’t know. The book is centered on an Asian family but the issues are, for the most part universal in that families can drive us all batty. Add in money and it gets downright insane. It was a solid read. The characters are many and the core family members are defined but many of the ancillary characters remain somewhat less rounded. The various plots and subplots for the most part all wrap up but I will admit to having some questions still at the end. I don’t know if I just missed something along the way – which is possible. There is a lot going on and my brain is my brain. – or if they were meant to remain ambiguous.